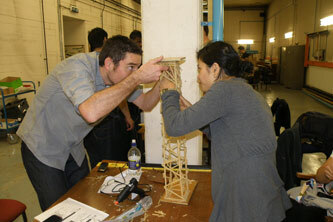 Keenly contested event provided test of creative problem solving abilities. 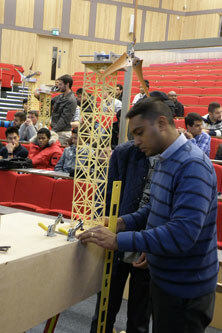 This year's City University London Wind Turbine Design Challenge was keenly contested. The event took place from 5-8 November and was sponsored by management engineering and development consultancy, Mott MacDonald. It was organised by Professor Keith Pullen and Dr Youyou Yan. The Challenge offered ten tutor groups of between five to seven first-year undergraduate engineering students the opportunity to design, make and test a small wind turbine for lifting a 2kg weight. Each tutor group was sub-divided into three teams, responsible in turn for: Team Alpha (3D twisted turbine rotor blades); Team Beta (Compound gearbox transmission); and Team Gamma (Tower using uncooked spaghetti). "This year's challenge was a fantastic opportunity for first year students to get a feel for the kind of creative problem solving that engineers are actively engaged in. They also got to experience the dynamics of good teamwork, excellent exposure to research facilities such as the workshops and wind-tunnel, as well as interaction with many staff." Renewable Energy Engineer, Rene Lindeboom, who represented sponsor Mott MacDonald at the event said: "Every year we see improvements in the Challenge that are obviously as a result of the right support given by City University staff. This year a talented group of undergraduate engineering students demonstrated plenty of enthusiasm and delivered beyond expectations." Judges included Professor of Instrumentation and Sensors, Sanowar Khan; Richard Basch (Chief Operating Officer of the School of Engineering and Mathematics and the School of Informatics); and Tim Young (Head of Marketing at the School of Engineering and Mathematics and the School of Informatics).